Instant Pot Stuffing is an easy recipe made in the pressure cooker. It keeps you out of the kitchen, so that you can spend quality time with your loved ones. It’s almost Thanksgiving! This holiday is all about family and friends. Getting together, talking, drinking, eating and having a lot of fun. Turkey! Check out my Instant Pot Turkey & Homemade Gravy recipe. 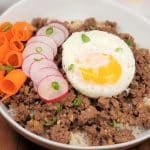 After this year and too many personal loses, I thought I would show you my super quick Instant Pot Stuffing Recipe made in the Instant Pot, Mealthy MultiPot or Pressure Cooker. 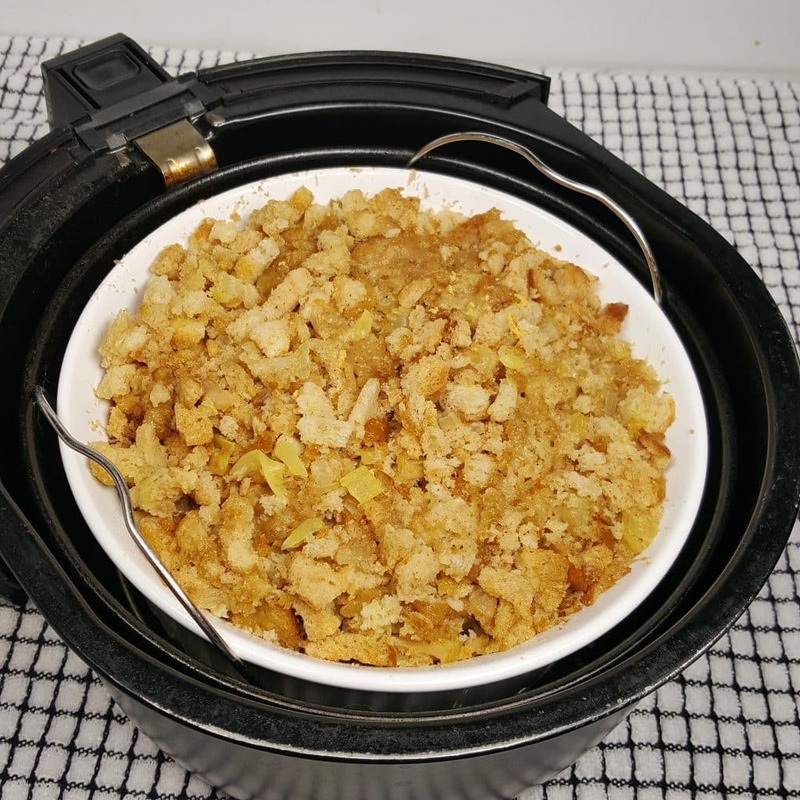 Last year, I made a delicious Thanksgiving stuffing in the pressure cooker. I took photos and was all ready to post the recipe….and then I totally forgot. 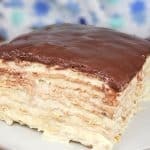 In light of what has just happened, instead of posting that recipe today, I decided to do a very simple recipe instead. 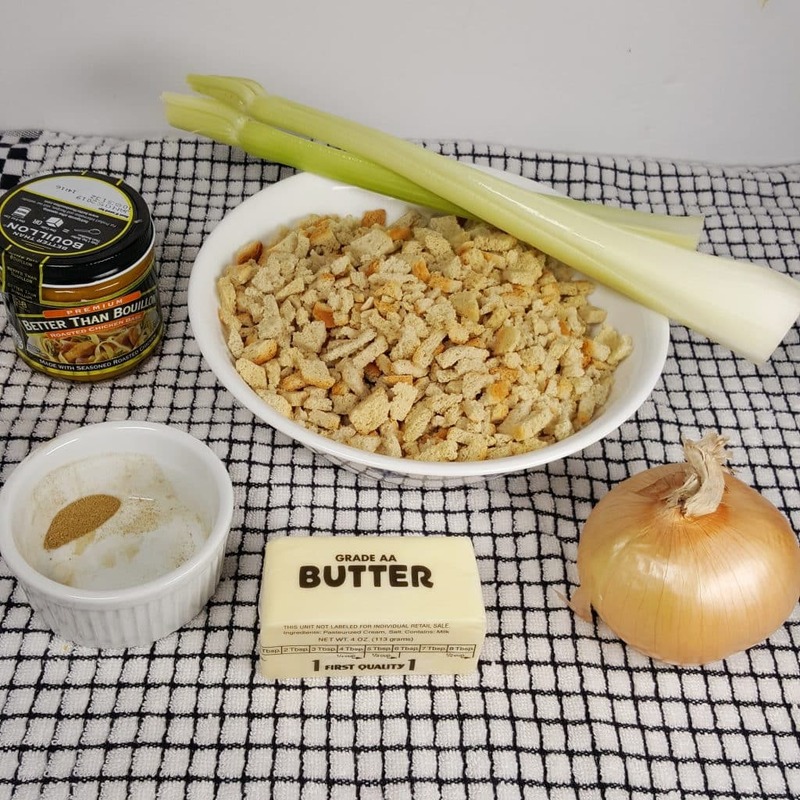 This Instant Pot Stuffing Recipe is dedicated to Claus Wagner Bartak. My very close and very loved friend, Claus, passed away early this morning. Claus and his lovely wife, Marlene became family to us, years ago. We used to live next door to each other in Florida and shared many meals together, including Thanksgiving. Talk about brains. Claus designed the Robot Arm on the Space Shuttle! They both speak multiple languages. Marlene was a College Professor. Marlene is an excellent cook and loves to use lots of special ingredients and spend hours cooking. She taught me how to make Spaetzle! Their daughter Natalie and son in law Raul, who live in Canada often visited Claus and Marlene. On our first meeting, they instantly became our family too and we have loved each other, ever since. Natalie is one of the most talented human beings I have ever met. 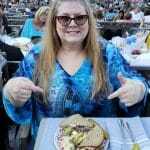 She is an incredible and creative chef and has a long list of other talents. 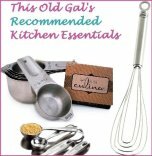 You might have heard me mention her in my Pressure Cooker Wild Mushroom Risotto Recipe. Raul, is a wonder dad and husband and an all around good guy. They have six beautiful children. I love them all so much. We all love to fish and I remember fishing down by AIA. We brought a grill and cooked and fished and had so much fun. Nadine, their other daughter who lives in Germany with her husband, is a super smart little cookie and we all fell in love with each other too. Several years ago, Claus and Marlene left Florida to move back to their home in Canada and we moved back to Los Angeles. Time got away from us and we hadn’t seen each other in a few years. We all rely on Facebook, rather than picking up a phone. Now it is too late. Pick up the phone! Skype. Visit. Don’t put off the visit, or you may never get one. If you have people you love, please, make a point to see them soon. Don’t have regrets. Normally, I baked a Sourdough Bread and a Cast Iron Cornbread (recipe coming soon). Then I dry them out and toast them. It take time. Forget about spending all day in the kitchen…just this once. How to Make Easy Instant Pot Stuffing. Grab a bag or a box of Stuffing or even your favorite Croutons. They are already filled with buttery goodness and lots of seasonings. 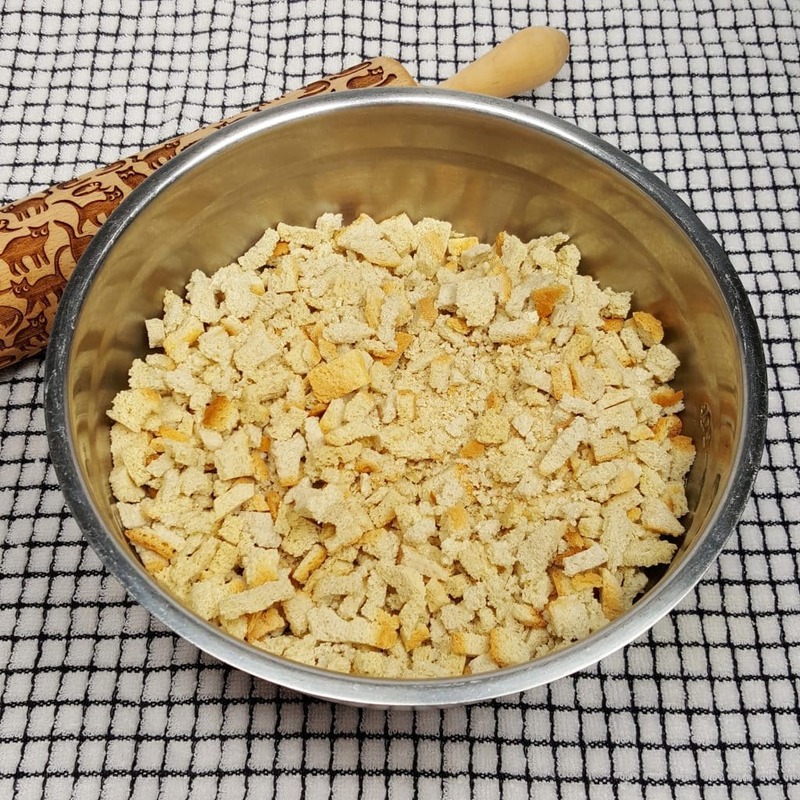 Take a Rolling Pin and smash them up a bit, if you use large Croutons. You know I love my cats. If your Croutons are the small cubes, you can leave them in tact. Toss the Stuffing into a Large Mixing Bowl. Make sure to let your Instant Pot, Mealthy MultiPot or Pressure Cooker heat up fully. If you don’t like Celery in your Instant Pot Stuffing, Water Chestnuts give a super nice crunch!!! Grab a Spatula and be careful not to let the Onions burn to the bottom of the cooking pot. This recipe will come together quickly and with very little effort. Alternatively, for more texture to the veggies (and my preferred way), skip the Sauté step altogether. 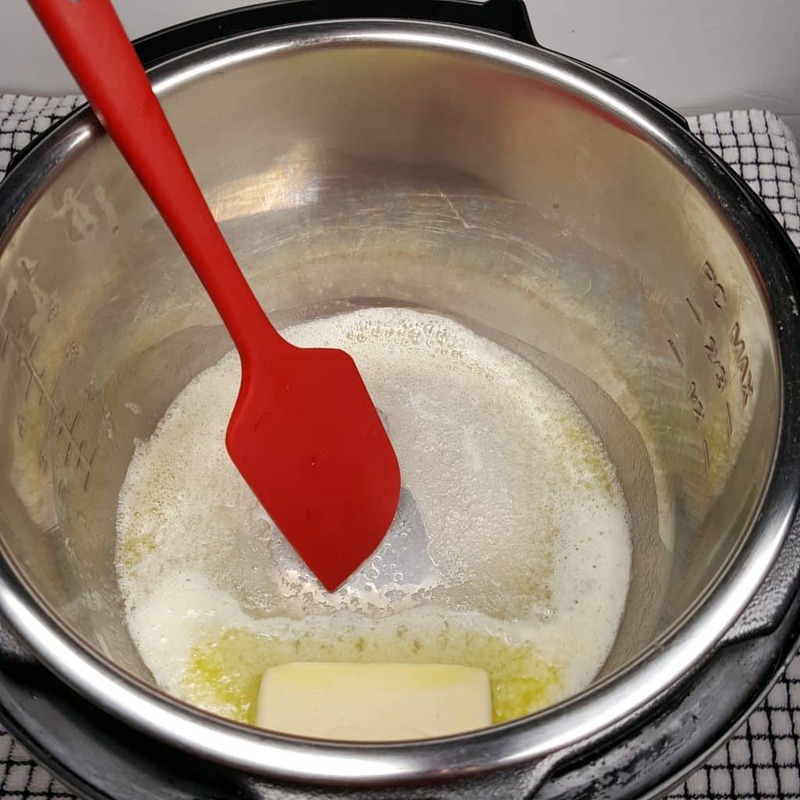 Add Melted Butter and all ingredients to a Large Bowl and combine. Mix in the Turkey Stock. If you don’t have some Turkey Homemade Bone Broth, try using a good Turkey Base, such as Better than Bouillon. Grab a Measuring Cup and mix up 2.5 cups of Broth. 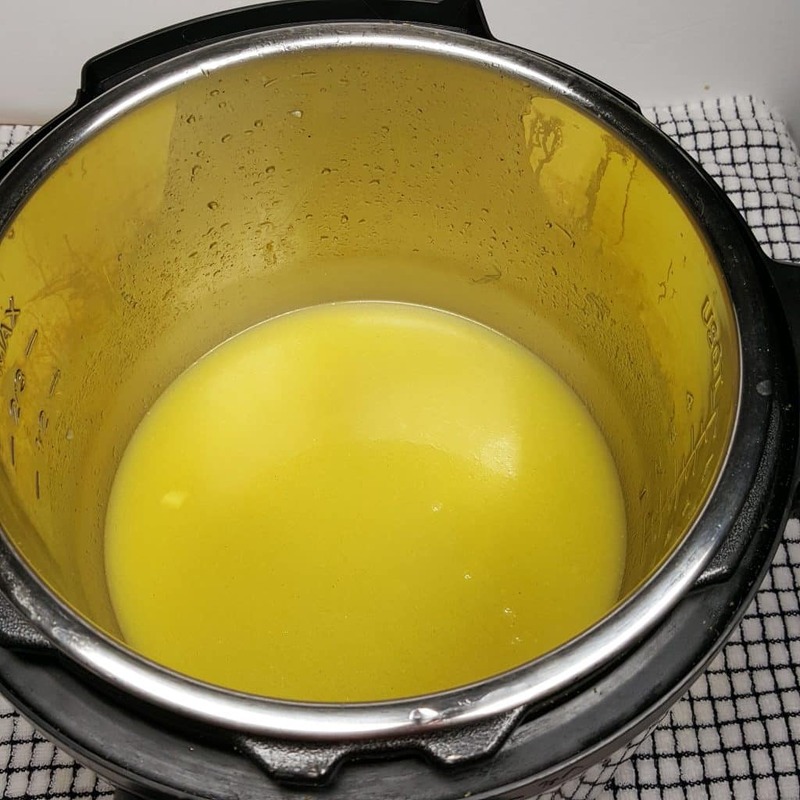 It’s really easy to make up a huge batch of my Instant Pot Bone Broth and freeze it using a FoodSaver. You’ll get the best flavor from making it yourself. I like to add a touch of Sage to my Stuffing. It’s optional, so if you do use it, remember, a little Sage, goes a long way. Add Ins for Instant Pot Stuffing. If there are other things you like in your Instant Pot Stuffing, mix it in now. This recipe is very basic, so anything you would like to add, just add it in and mix. Tips and Tricks for Instant Pot Stuffing. Dice celery smaller than the onions. 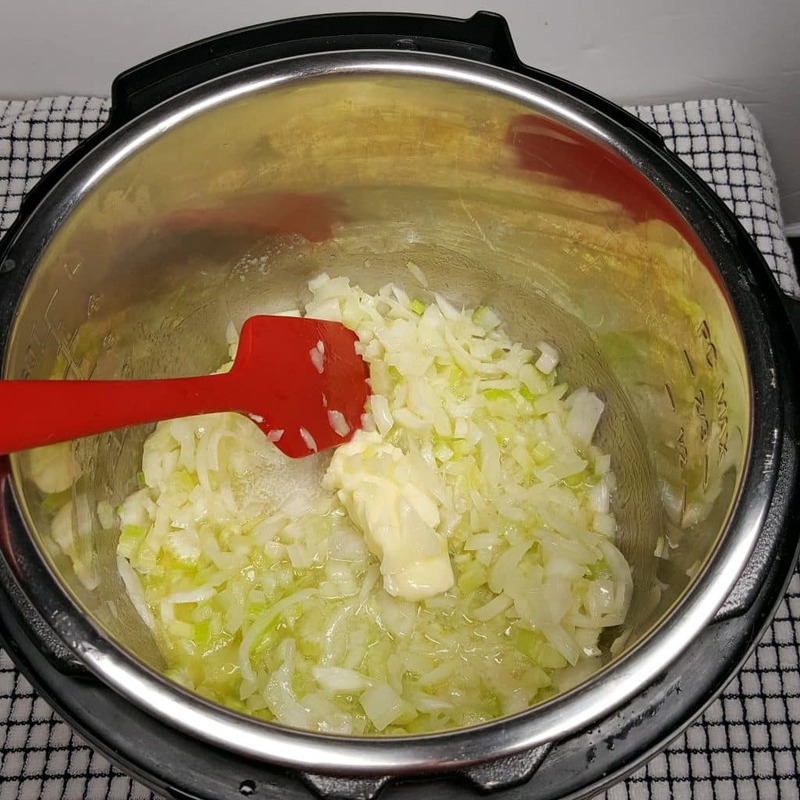 Onions cook and become soft very quickly, so dicing them larger than the celery will help to keep the vegetables nice and even. Use Turkey Broth as the cooking liquid. It seems so obvious, right? Just like in my Pressure Cooker Greek Meatballs, the liquid does not need to be water. Mix up some Water with a little Better Than Bouillon Turkey Base and add it to the cooking pot. No need to cover the pan of stuffing and no need to worry about water getting into the pan. Because, we want the Water Turkey Base to get into the Casserole Dish!!! 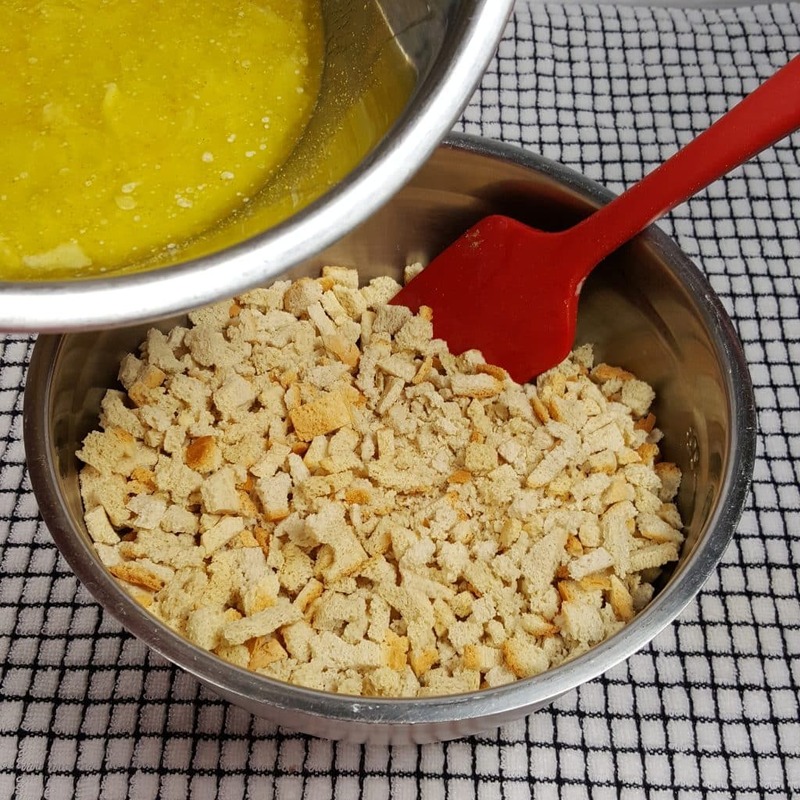 Simply use less Turkey Broth when mixing up the Stuffing Mix. The Hot Turkey Broth will infuse into the pan of Instant Pot Stuffing and keep it moist, while adding more flavor. But, there is another reason!!! If you have the Trivet that came with your Instant Pot, Mealthy MultiPot or Pressure Cooker, lower it in with the handles. If not, this is a nice Trivet to use. Make a Foil Sling and lower the Casserole Dish of Stuffing into the Instant Pot, Mealthy MultiPot or Pressure Cooker. Dot the top of the Instant Pot Stuffing with Butter. That’s it. You can enjoy Instant Pot Stuffing for Thanksgiving as is, or you can brown the top. It’s a matter of preference. Do you like stuffing cooked inside the Turkey or in the Oven? 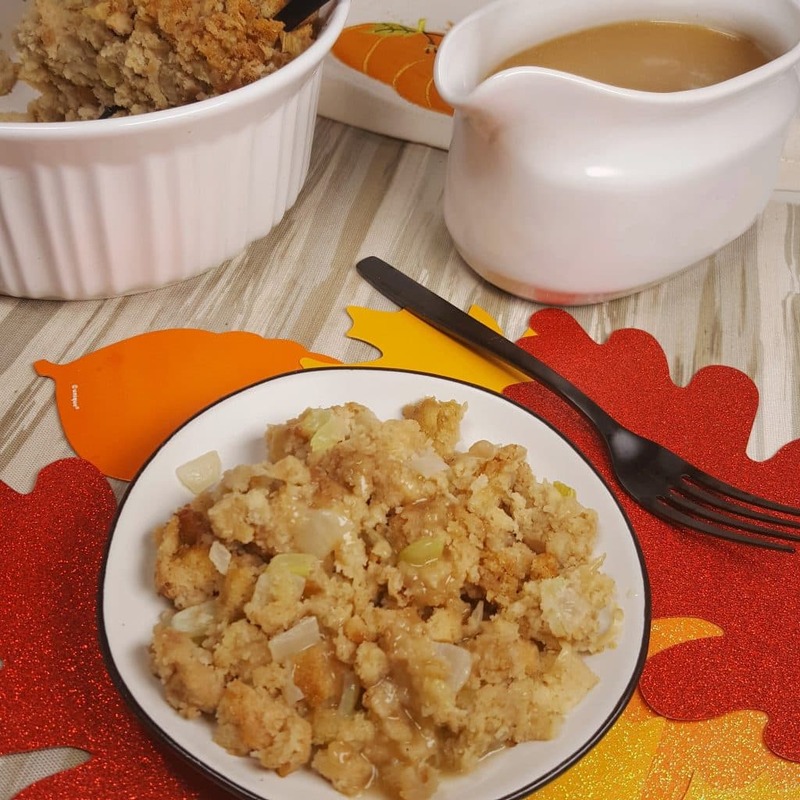 If you like it cooked inside the Turkey, you will love this Instant Pot Stuffing right out of the Instant Pot, Mealthy MultiPot or Pressure Cooker. If your preference is a drier Stuffing, then pop the Casserole Dish into the oven for a few minutes, after pressure cooking. What to do with Leftover Instant Pot Stuffing. Firstly, make a double batch of Instant Pot Stuffing so that there will be leftovers. 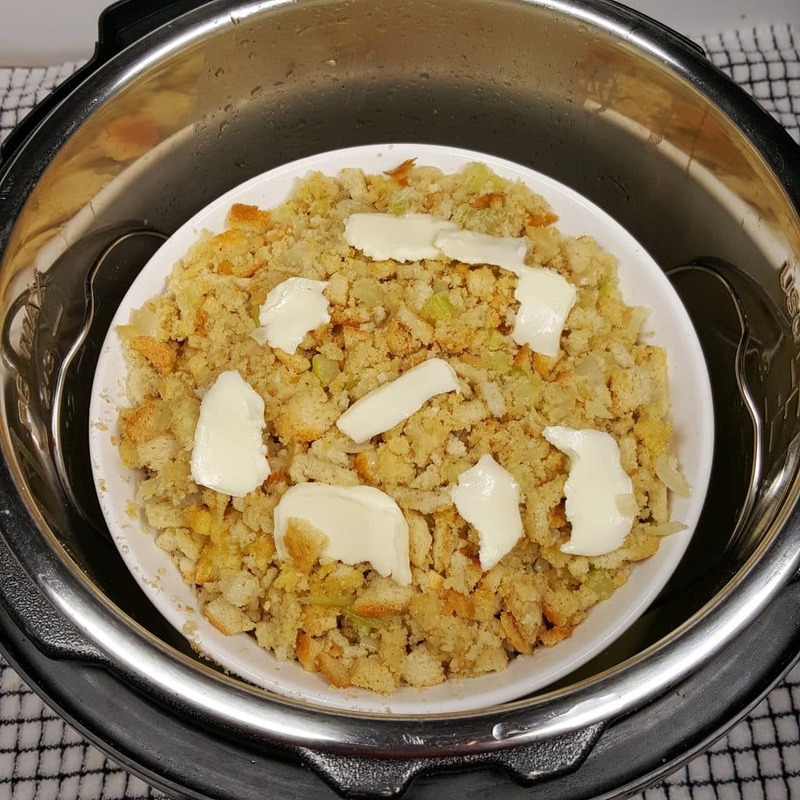 Instant Pot Stuffing is so easy and quick to make in the Instant Pot, Mealthy MultiPot or Pressure Cooker you will definitely want to make more so that there are lots of leftover Instant Pot Stuffing for the next day. 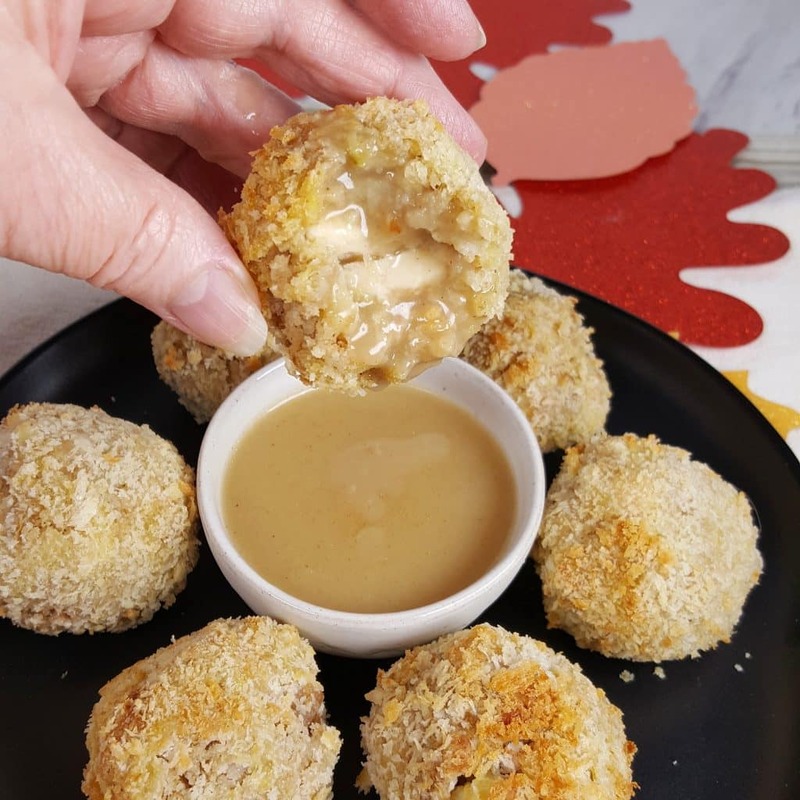 How yummy do these Air Fryer Turkey Croquettes look? 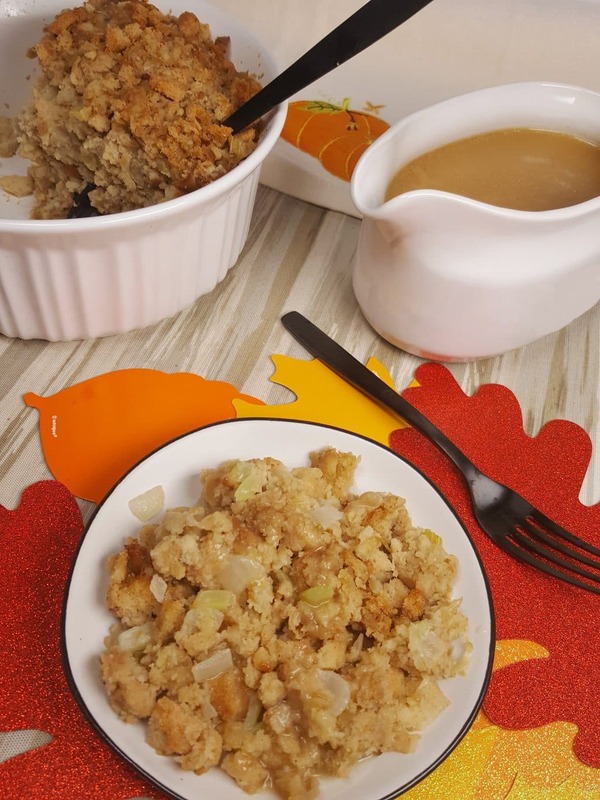 They are the perfect recipe for leftover Thanksgiving Instant Pot Stuffing and Instant Pot Turkey with Gravy. 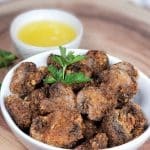 They only take a few minutes to prepare and then a short cook time in your Air Fryer. So, you might want to make a double batch of Stuffing! For a crispy top, place the Casserole Dish right into the Air Fryer. You can also pop it into the oven and cook it along side your turkey or other items. To make sure the Stuffing doesn’t try out, use the Turkey Broth from the cooking pot and pour a little over the top of the Casserole Dish. Save the rest of the Turkey Broth and add it to the pot of the Instant Pot Thanksgiving Turkey. It will add extra flavor for the gravy! You don’t need to brown the Stuffing though. It’s perfectly delicious right out of the Instant Pot, Mealthy MultiPot or Pressure Cooker. So, there you have it. This super simple, easy Instant Pot Stuffing recipe. 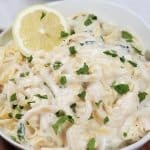 Serve it in the same Casserole Dish it cooked in and save an oven transfer. You can make this in advance and heat up, right before you eat. More Instant Pot Thanksgiving Recipes to Love. Clausy, I know my sweet boy, Chester, who crossed the Rainbow Bridge on October 10, 2017, greeted you with purrs. Cuddle him for me. I love you both. Select Sauté/Browning and allow Pressure Cooker to fully heat. Add Butter, Celery and Onions and Sauté one minute. Pour in 1.25 cups of Turkey Broth and a pinch of Sage. Mix through. 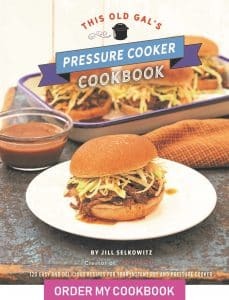 Shut off Pressure Cooker. Butter Casserole Dish and pour in Stuffing Mixture. Don't pack. Add the rest of the Broth to cooking pot and place Trivet in pot. Place Casserole Dish on top of Trivet. Lock on Lid and close Pressure Valve. Cook at High Pressure for 13 minutes. When Beep sounds, wait 10 minutes and then release the rest of the pressure. Serve as is, or place in Air Fryer or Oven. Pour over 1/2 cup of Turkey Broth. Bake until top is slightly brown. For a fluffier Stuffing beat an egg and add before cooking. Add in any extras you may like, such as Diced Apples, Roasted Chestnuts, Sausage, Raisins, Walnuts. 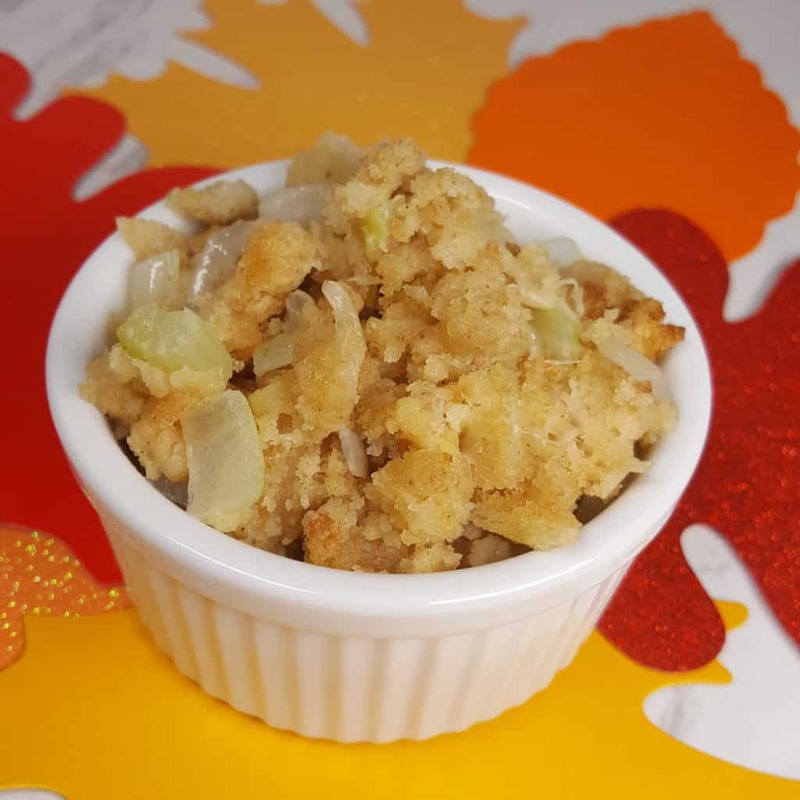 PIN this Pressure Cooker Stuffing Recipe! Easy Instant Pot Pressure Cooker Stuffing! My sincerest condolences on your recent losses. I’m so very sorry. How many cups of stuffing is in a 12 oz. 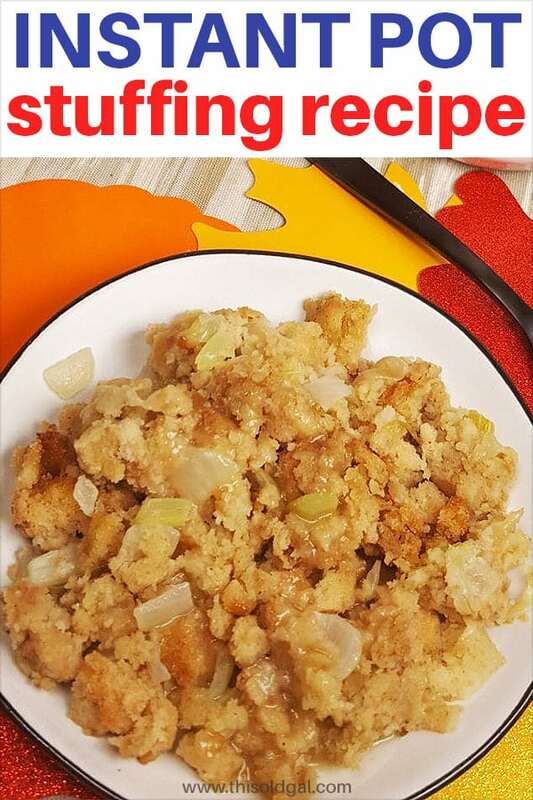 box of stuffing mix? Any differences fin you want to use bread, and not a processed mix? Way to go, girl! Your recipes are my faves when using my IP! They haven’t failed me yet! Blessings to you and yours this thanksgiving! What size casserole dish is this? I don’t want a whole set. I just found your stuffing recipe, and it’s a lifesaver, as is your entire blog. We’ve enjoyed so many of your recipes this year and finding this one today is just perfect. I need any tips & techniques to make my day of cooking easier. I have been looking for a dish that will fit in my 8 quart Instant Pot Duo 80. Please tell me exactly what size casserole dish you are using. I see the link to Amazon, but you have two links and the other goes to something else. Please advise. Can you make this without the casserole dish?